The Collaborative Economy is an economic model where ownership and access are shared between people, startups, and corporations. Altimeter Group has been tracking the progression of social business in the enterprise for quite some time now. 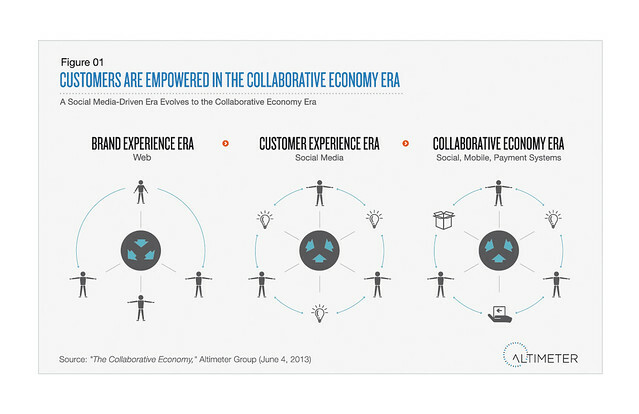 Last winter, Altimeter began a deep analysis of recent trends in collaborative economy and how they will disrupt business. 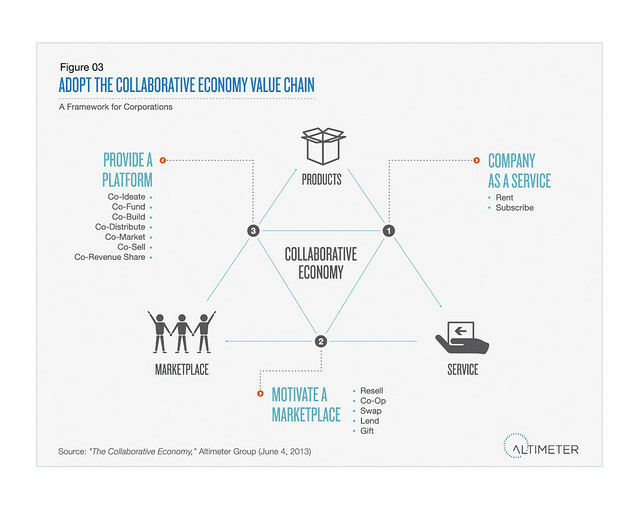 The Altimeter collaborative economy framework illustrates how companies can innovate their business models, becoming a Company-as-a-Service, Motivating a Marketplace, or Providing a Platform. These three models represent increases in collaborative adoption within the enterprise — producing increased results at each level. The most forward-thinking company will utilize all three methods in their business model. The first phase era of the internet allowed few to publish, yet disseminating knowledge. The second social era empowered everyone to share ideas. Now, the third era, the Collaborative Economy, empowers customers to share goods and services, continuing to shift power to the crowd. In February, Jeremiah Owyang, an Altimeter Analyst, began a comprehensive list of how the collaborative economy shift is disrupting many industries like banking, transportation, entertainment, travel, consumer products and much more. During the research phase, Altimeter produced a whole series of posts analyzing their collaborative economy discoveries as they unfolded. I encourage you to read the Altimeter’s Collaborative Economy Report and consider how this concept applies to your company and industry. Jeremiah Owyang’s Collaborative Economy LeWeb London 2013 presentation. 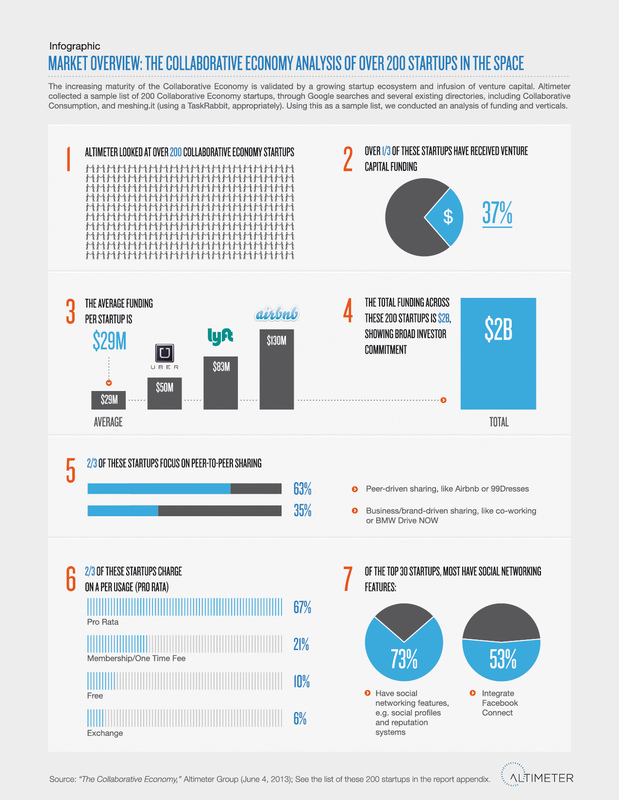 Michael Brito’s review on how collaborative economy is disrupting business. Heather Whaling’s 5 PR Opportunities in the Collaborative Economy. How has the latest stage of social business — collaborative economy — impacted your business/industry? This entry was posted in Business Innovation, Digital Transformation and tagged business model innovation, collaborative economy, digital transformation, future of work. Bookmark the permalink.